How many shopping trips do you make for back to school? I was having a conversation with Adrian last night about how hectic it has been getting Sammy ready for school this year. There have been multiple visits to the doctor, the school and of course to the mall for her uniforms. When it comes to school supplies, our school is really bad too, because first you get the list of supplies for the children and on the first day, you get the list of supplies for the class. That means that I will be making multiple trips to the store for both sets of supplies. And don't get me wrong, I love the back to school season, I love shopping for school supplies! I just wish it wasn't so hectic and that the stores were not like a mad house. Enter Walgreens, my favorite store. 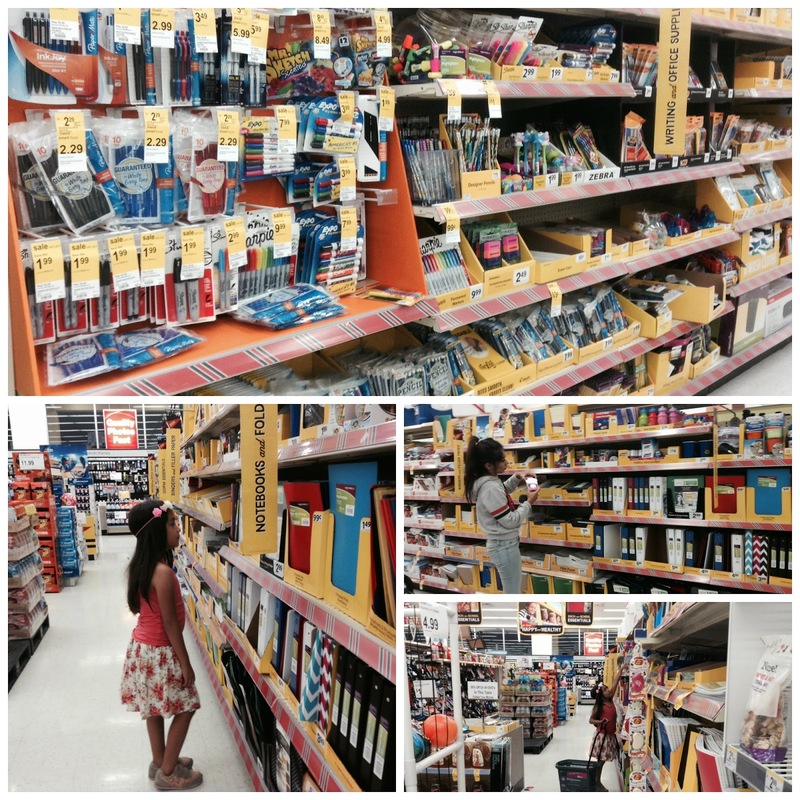 When it comes to back to school essentials and all those little extras, Walgreens is a great place where you can quickly pop in, without having to face the crowds and lines. The kids and I took a trip this weekend to Walgreens to get Sammy some of her things and it felt so nice to have so much room to look around and pick out her supplies. Of course we were on the hunt for all things girly and cute. But very important is also price, and at Walgreens you can definitely find some good deals. And I love that in this large selection, you can find many cute little extras that the kids will love, like this cute little bag full of erasers, or this peace design compostion book. You can also find all of the other essentials: pencils, crayons, pens, highlighters and even backpacks. Which means that Walgreens is also a good place to grab something you might have forgotten at another store. There is never a time when I remember to get every single item, and will always have to go back. Some of the stuff I always forget: vitamins, hand sanitizer, tissues and lip balm! If your store has a Walgreens Healthcare Clinic, you can also take advantage of the youth sports physicals and School physicals for only $49* (available for patients age 21 and under). Walgreens is a convenient place to get these check ups with no appointments necessary because walk-ins are always welcome. Pending one more shopping trip for the classroom supplies, my baby is pretty much set to go. Armed with school suppplies that she picked out herself, she is happy to be heading back to class. Are your kids ready to go back to school? Join us at the bilingual #WalgreensLatino Twitter Party for inspiration and ideas on how to simplify your back to school prep with the help of Walgreens. From essential supplies to easy ways to stay healthy with the Healthcare Clinic, we'll be sharing information on how to satisfy all your back to school needs in once place and giving away $550 in Walgreens gift cards! RSVP here. “*Promotion ends 9/7/14. Sports and school physicals not typically covered by insurance. Certain exceptions, including age restrictions, may apply. Patient care services at Healthcare Clinic at select Walgreens provided by Take Care Health Services, an independently owned professional corporation whose licensed healthcare professionals are not employed by or agents of Walgreen Co. or its subsidiaries, including Take Care Health Systems, LLC. Walgreen Co. and its subsidiary, Take Care Health System, LLC, provide management services to in-store clinics and provider practices.” Visit walgreens.com/gobackhealthy for details.